What's Black & White, and "Read" All Over? In addition to www.lookonline.com , (I would hope), these past days, it would have to be The Daily Front Row, which, along with WWD, The New York Times fashion supplements, and a number of other show and fashion related material, was handed out to show goers each day at The Lincoln Center venues. On Wednesday morning, heading into The Theatre, to see Michael Kors' spring collection, we were greeted with the latest edition, featuring an eye popping cover. It was a graphic black & white homage to Marc Jacobs, whose well received 6 1/2 minute runway show on Monday night, was a study almost entirely done in varying combinations of black & white, with touches of red and some beige thrown in for good measure. The cover, featuring a photographic collage of some of Marc's black & white stripes, dots, checks, houndstooth, and leopard print designs, was offset against a swirling, almost psychedelic black & white background to further emphasis the point, and the cover lines read: "Vortex of Chic: Marc's Best 6 1/2 Minutes". 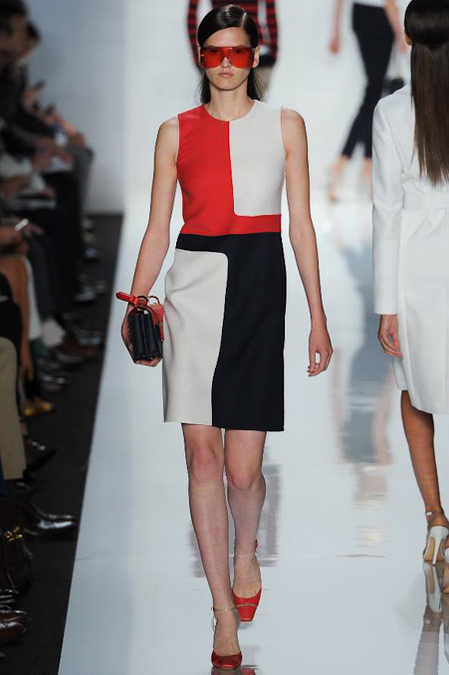 The positive reaction to Marc's show is not at all surprising given the universal appeal of iconic black & white. It's one of those fashion statements that never goes out of style and never loses its appeal. It's fresh, eye catching, and a palette cleanser and instantly makes everything else look old hat and demode. When I took my seat, I read Michael's run of show, to see what the collection (for women and men) would look like, and I was happy to see that it promised "geometric glamour", graphic stripes, optical checks, and graphic combos of black and white, among other things. While the main color palette that would define Michael's 65 piece collection, was crimson, navy, and white, with touches of palm (green) and sun (yellow), the navy was so dark, it could really pass for black. Bold stripes, in crimson and navy, and navy and white, began the show, and it looked snappy, sporty, and terrific. Shapes kept sleek, simple, very pared down, and minimal. There were striped and graphically color blocked bodysuits, pullovers, twill coats, shifts, techno twill blazers and pants, paillette skirts, shorts, and maillots. One particular standout was the white and navy striped cashmere pullover with a white and navy striped shantung pleated skirt. When red was used, it made quite a statement, (a bodysuit with a graphic cut out back, was shown with a crepe duvatine skirt, and a beautifully cut coat in duchesse, was shown with a matching trouser). Nanette Lepore showed right after Michael Kors, and her well done 30 piece collection began with a black & white checked wrap dress, accessorized with a wide woven belt. 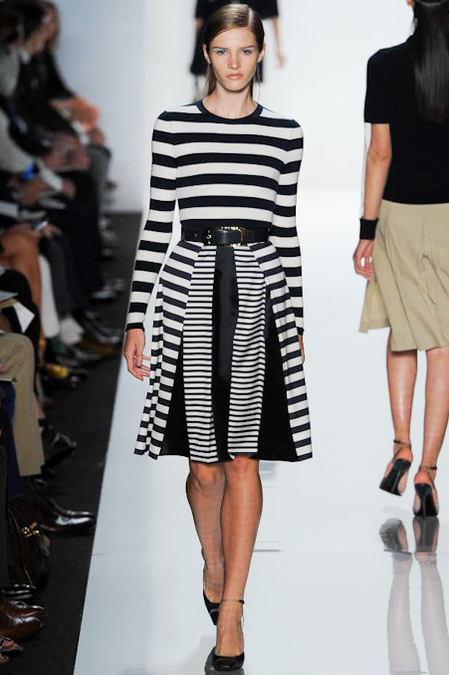 She made a statement with black & white, using it repeatedly (narrow stripes and checks). They took the form of jackets, shorts, skirts, and pants, and were always combined with pieces in a contrasting color and/or print. 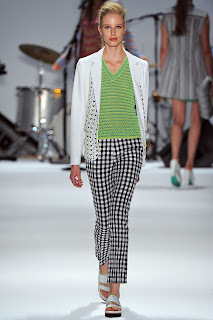 The best pieces were the pistachio printed jacket with black & white striped shorts; the elongated black and white striped vest worn over a clover applique dress; the white jacket decorated with black beads which was paired with a pistachio knit top and narrow black & white checked pants; and the clover raffia jacket worn with a clover print top and black & white checked shorts. In addition, she showed swimsuits, black jersey dresses both long and short (with black lace or mesh details), and a group of very pretty dresses in art inspired coral and sky blue prints. Enjoy all of your favorite entertainment on the vivid 10.1" touchscreen display of this 16GB tablet. It's loaded with the Samsung Media Hub, so you can stream thousands of movies and TV shows and with access to Google Play and Samsung Apps you can choose from over 450,000 apps. 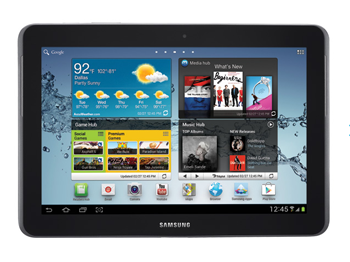 The Galaxy Tab 2 10.1 has a fast dual core processor and it has a microSD slot so you can add additional memory, if you need it.